Wing span: 1 3/4 - 1 15/16 inches (4.5 - 4.9 cm). Identification: Upperside of wings is dark brown; center of forewing with a transparent gold band. Fringes are checkered. 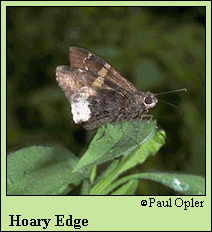 Underside of hindwing is black-brown with a wide silvery white band along most of the outer margin. Life history: To seek females males perch in forest openings on branches about 3-6 feet above ground. They fly out repeatedly to chase other insects but will return to the same perch. Females lay eggs singly under leaflets of host plants that are in full or partial shade. Caterpillars hibernate. Flight: One brood from June-August in the north; 2 broods from April-September in most of its range. Caterpillar hosts: Beggar's ticks (Desmodium); occasionally false indigo (Baptisia) and bush clover (Lespedeza); all in the pea family (Fabaceae). Adult food: Nectar from flowers of common milkweed, dogbane, buttonbush, Japanese honeysuckle, and New Jersey tea. Habitat: Open woodland and brushy areas, particularly oak or pine woods with sandy soil. Range: Eastern United States from central New England south to northern Florida; west to Iowa, eastern Kansas, and central Texas. Outlying record from western Kansas.